Help keep your kids and spouse safe by teaching them what to do if you become incapacitated. 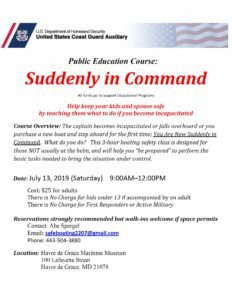 Course Overview: The captain becomes incapacitated or falls overboard or you purchase a new boat and step aboard for the first time; you’re now “Suddenly in Command.” What do you do? This 3-hour boating safety class is designed for those NOT usually at the helm, and will help you “be prepared” to perform the basic tasks needed to bring the situation under control. Cost: $25.00 (No charge for kids under 15, if accompanied by an adult.) First Responders and Active Military attend for FREE. Pre-registration strongly recommended, but walk-ins welcome if space permits. To register, please email Abe Spergel at safeboating2207@gmail.com, or call/text (443) 504-3880.